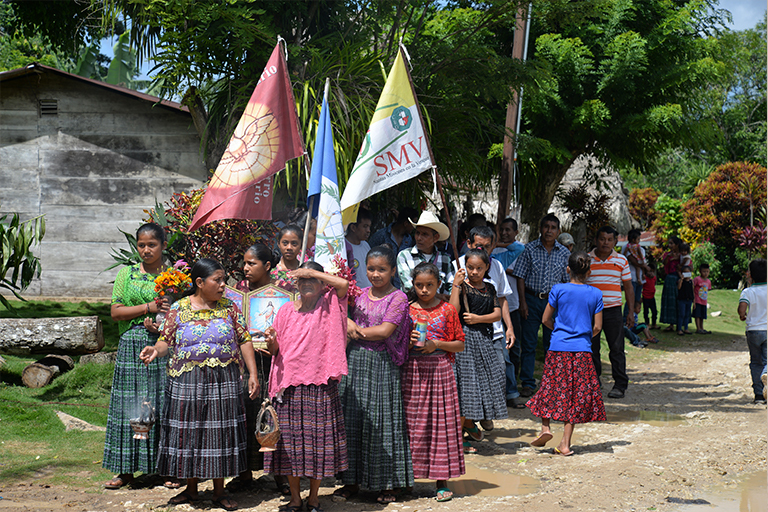 Women from Pie del Cerro prepare to lead a parade celebrating the lights coming on in their remote Guatemalan village. After three weeks of hard work by line crews from Colorado and Oklahoma, the lights came on for the first time in two remote Guatemalan villages October 2. Just as they have done in the United States, co-op linemen brought electricity and a better way of life to our neighbors in Central America. The line crews that made up the “Energy Trails” team gave their blood, sweat and tears to build 5 miles of distribution system and install the inside wiring for more than 100 homes, two churches, two schools and two medical clinics in the villages of Pie del Cerro and Tierra Blanca Salinas. They traveled over makeshift roads and worked long hours in sweltering heat and humidity to complete the much-needed project. When it was done, one more corner of the developing world had electric lighting and power. The Colorado Rural Electric Association joined our partners at the Oklahoma Association of Electric Cooperatives and NRECA International to send some of our best men to Guatemala to provide electricity to the two villages. Working without the bucket trucks and modern equipment available in the United States, the line crews relied on “old school” techniques using ropes and hand tools to string the lines and hang the transformers. In celebration of this historic event, the children and families from the villages saluted the co-op linemen with a parade, a flag-raising ceremony, speeches and a special banquet to thank them for bringing power to their communities. The inauguration ceremony on October 2 was a joyous occasion, complete with drummers, dancers and incense-carrying villagers who escorted the Energy Trails team to the school grounds for an elaborate program recognizing their service. Following speeches by local dignitaries, the ceremonial first light was switched on and the party began. The efforts of the Energy Trails team to bring electricity to these two rural Guatemala villages is in the best tradition of the electric co-op program. For over 80 years, electric co-ops in Colorado and across the country brought power to rural areas that would not otherwise have access to it. Electric co-ops have provided electricity to the most remote areas of the United States and we believe we have a responsibility to help people in other parts of the world as well. NRECA International has been doing just that since 1962, and we were proud to join our Oklahoma friends to complete this project in Guatemala. The real heroes of this effort, of course, are the linemen from Colorado and Oklahoma who volunteered to be away from their families and friends for three weeks to help people they had never met and who they will probably never see again. Each day, the Colorado and Oklahoma crews navigated a bone-jarring dirt road from Playa Grande to the job site; just getting back and forth from the villages each day required two hours on the road. They often arrived back in Playa Grande at 9 or 10 p.m. after a sweat-soaked day in the field. The Colorado crew consisted of Ben Ludington from Poudre Valley Electric Association in Fort Collins; Nate Towne from Mountain Parks Electric Association in Granby; Chet Stickler and Christian Baker from Holy Cross Energy in Glenwood Springs; Kelly Snow from United Power in Brighton; and Kris Barbee from Southeast Colorado Power Association in La Junta. The Colorado team leader was Dale Kishbaugh, CREA’s director of safety and loss control. These men from the Colorado co-op family deserve our gratitude for representing the Colorado electric co-op program in an exemplary way and for completing a project that will forever change the lives of many children and families in the two villages. During this season of Thanksgiving, I am thankful for many things: my family, friends, good health and great fortune to be an American. But I am especially thankful this year to be associated with the incredible linemen of the Energy Trails team who gave their time, skills and, most importantly, their brotherhood to people in need. Many thanks for a job well done.